Having eaten at the popular Asian fusion restaurant Red Spice Road for a work function roughly two months ago (and thus being denied the opportunity of taking photos) I have craved going back again in order to do a proper review. Both times I was there for the lunch banquet (three dishes for $25 pp or five dishes $30 pp) where appetizers are provided and diners can choose from a five-item menu that changes every month. As there were three of us dining this time round, we couldn't get the five dish option which requires a minimum of six people, so we had to choose three dishes between us. The menu offered a pork, chicken, beef, fish and a seafood dish, with the option of changing one to a vegetarian dish if required. The appetizer however was set and came out first. 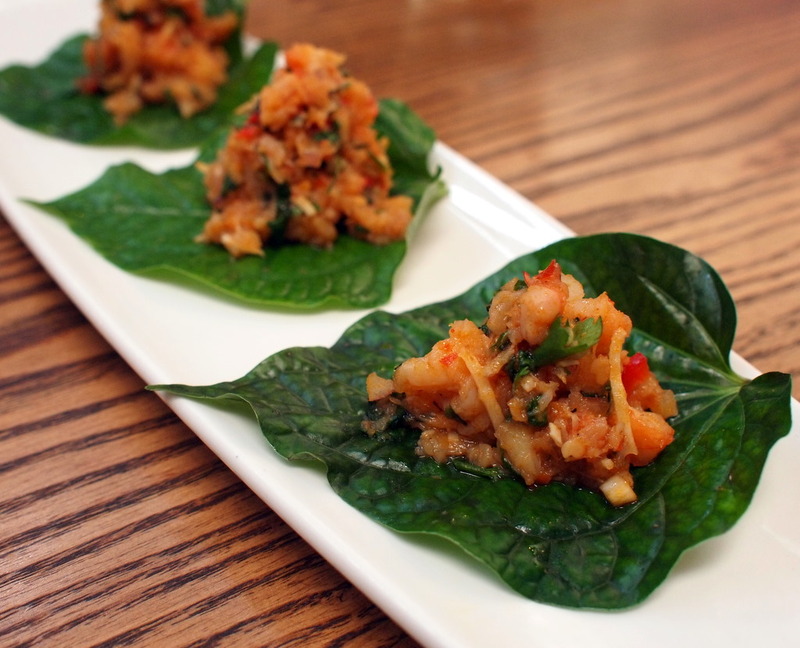 I can't remember if this betel leaf with chicken, smoky eggplant, coriander and lemongrass dish (what a mouthful!) was the same as last time, but it was certainly tasty and whetted the appetite for the dishes to come. Being a fan of eggplant I was a little disappointed that it didn't have much prominence in the dish, but all was forgotten when the waiter appeared with our three mains, and a bowl of fragrant, steaming jasmine rice. So what did we have? 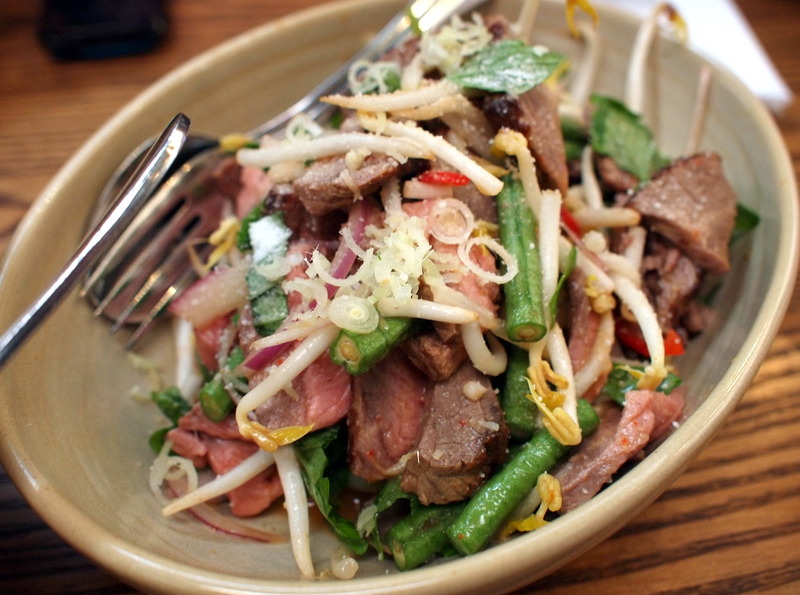 First up: Lap Khmer - a Cambodian beef salad with basil, mint, snake beans, roasted rice powder and chilli. The beef slices were tender and cooked to perfection and was a stable counterpoint to the refreshing greens and herbs. The barramundi sour orange curry with silk melon and potato wasn't actually sour, but we can forgive them because it tasted so good with the rice. 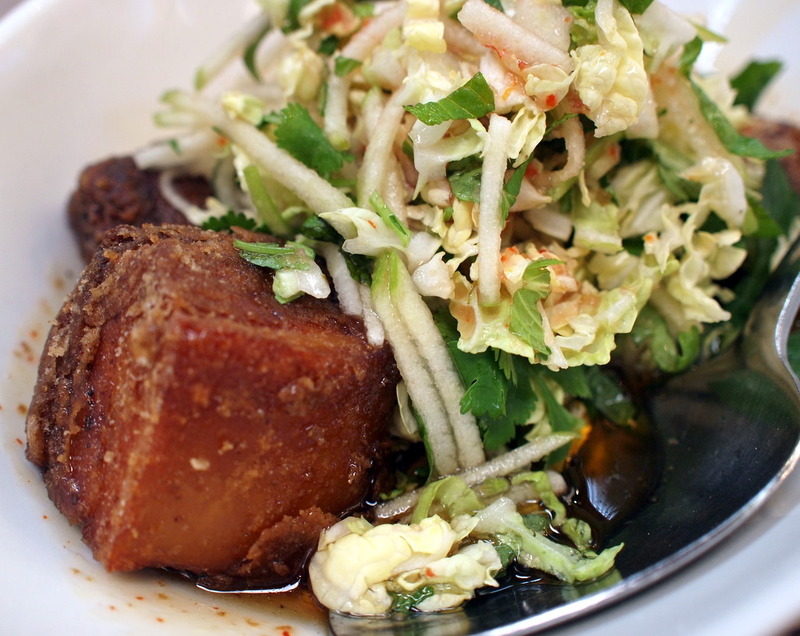 The highlight of course was the pork belly with chilli caramel, black vinegar and apple, cabbage, mint salad. 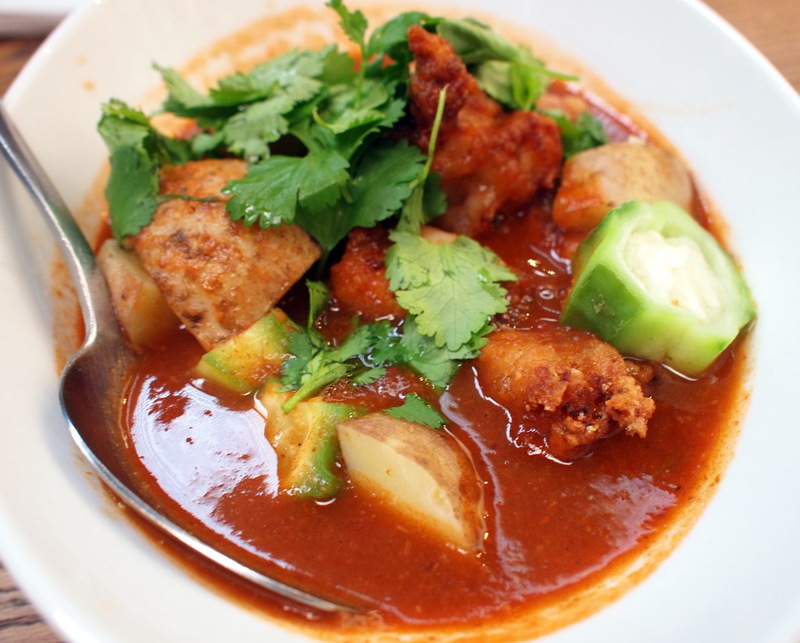 Red Spice Road knows this all to well, with this being the only dish that remains on the ever-changing menu. It's no wonder really seeing as no self-respecting Asian restaurant would fail to offer pork belly when Melbourne is currently so obsessed with the dish. And oh my what a dish. Having two pieces per person seemed like a glorious indulgence, it was just that good. I only managed a single picture of this before it was ravenously attacked, by me. For $25, this was a very good meal and it's no wonder that even when diners are forced to sit side-by-side, sharing tables, that this is a hugely popular restaurant with the CBD lunch crowd, I'm not sure that this would quite be the venue for an intimate date night, but if you're just after good food, then this place is definitely somewhere you should visit. The decor with the huge light shades are also sure to get people talking. I adore Red Spice Road. It's one of my favourite places to eat. And that pork belly - divine doesn't even cover it. Sublime.